Will Obama Blow the Progress of the Last 8 Years? Eight years ago the Butcher of Baghdad was ruling Iraq. The Taliban was in control of Afghanistan. Libya was working on weapons of mass destruction. 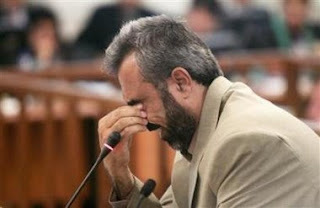 The first live witness against Saddam breaks down in court while recalling the horror from the former regime. 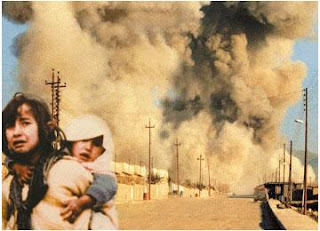 148 Iraqis were murdered by the Saddam Regime including children in the village of Dujail, north of Baghdad, in 1982. Estimates of casualties range from several hundred to 7,000 people. 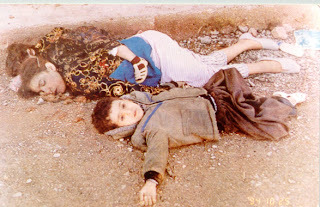 In southern Iraq entire populations of Marsh Arab and Shia Muslim villages were forcibly expelled. Saddam evil on film… Tongue, arm, finger, hand amputations on video- HERE. Today… The Iraqi government is in control of 13 of 18 provinces. Map of Iraq showing provinces transferred from US to Iraqi control. 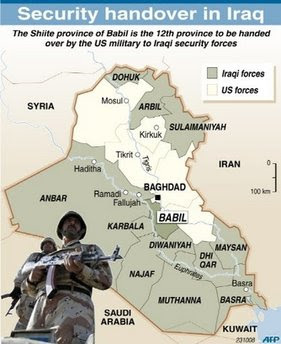 Iraq recently took control of the central Shiite province of Babil from US forces, in what local officials said was further sign of security gains across the war-torn nation. Today… Iraqi and US Casualties are at record lows. Afghanistan and Iraq are fledgling democracies. Al-Qaeda’s leadership has been decimated and the terrorists are on the run. The Taliban is out of power. But, that could all change with the radical in the White House. Al-Qaeda is already celebrating the Obama win. Obama has promised to withdraw troops from Iraq. Afghanistan is struggling with the Taliban again. Pakistan is unstable. Iran is developing nukes. Barack Obama has some big decisions in front of him. Let’s pray he doesn’t blow it.